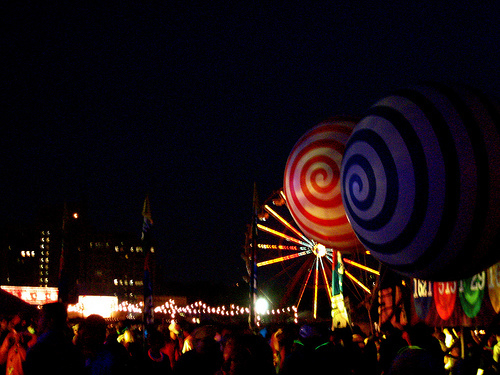 The Harlem River Event Site on Randall’s Island is a unique outdoor venue. 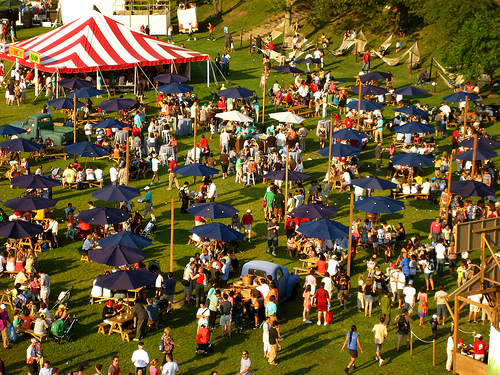 In recent past, this designated event site has hosted Cirque du Soleil, Farm Aid Benefit Concert, Dave Matthews Band, the Avon’s Walk for a Cure Breast Cancer event and many other exciting events. Proceeds from revenue events support the care, maintenance and stewardship of the park, and provide free youth programs provided by the Randall’s Island Sports Foundation to over 14,000 children annually from the neighboring communities of East Harlem and South Bronx. 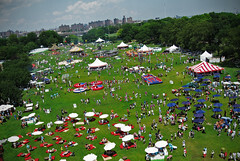 New York City Department of Parks & Recreation encourages major corporations and sponsors to select this venue and is honored that Bloomberg LLP continues to choose Randall’s Island for their annual employee corporate picnic. Thanks for stopping by and for your comment. I see from your website that you represent the NYC Parks Department in some form and the Randalls Island Sports Foundation. One major difference with those OTHER events that you list (Farm Aid, Cirque du Soleil, etc.) is that they are OPEN TO THE PUBLIC. Randalls Island is, after all, a public space. With so much of it under construction already and out of reach, it seems egregious for another large swath of the land to be closed for a private party – for weeks at a time. The other issue is, as Juan Gonzalez from the Daily News tried to discover last YEAR, what did Bloomberg L.P. pay the Randalls Island Sports Foundation for use of the space? This is one of the problems with “private-public partnerships,” of which Mayor Bloomberg and Parks Commmissioner Benepe are such big fans. There needs to be transparency and accountability to New Yorkers of how our public spaces are utilized. Private-public “partnerships” are currently abusing the public’s trust by skirting this issue once the reins are handed over to a private entity. This is a BIG problem. Look at Union Square and how much control the local BID – Union Square Partnership – has been given over Union Square Park – a PUBLIC SPACE. While I appreciate your wish to encourage “corporations and sponsors” ‘to use Randalls Island for their private events, I think you might want to reflect on the difference between renting out the Hammerstein Ballroom, for example, and Randalls Island, a public space for all New Yorkers. How do you define “open to the public”, as in farm aid, cirque du soleil, dave matthews concerts etc? Don’t the organizers rent the space, set-up their facilities, make people pay to attend, hire security to keep non-payers out? I totally agree about transparency. How much do they charge for 100 acres for 2 weeks? The down-side of transparency is that we might find out that the mayor has paid far more than we think for the use of the space. If that’s true, people will feel ripped off if the city lets promotion companies for farm air, dave matthews, or cirque du soleil rent the space for anything less and sell tickets for $200 a pop to elites. It seems like a GOOD idea to have someplace in the city for large outdoor gatherings, and whether it’s the pope or prince, someone besides taxpayers ought to pay, no? Also, is the Union Square BID a good thing or a bad thing? It’s bad, right? It’s our park, not BID’s. Nonetheless, yes, I will ! Thanks for pointing that out to me. I will do so later tonight or first thing tomorrow. I’m also guessing the Bloomberg L.P. summer party is coming up again. A lot of people have been finding this post from last year which I wrote on June 23rd after last year’s gala event. I haven’t heard yet about this year’s (unless it happened already). Is it on Randalls Island this year? I’d be happy to go as someone’s guest! Thanks for your interest in the answer to sonofashoe’s questions. Feel free to ask me further questions or for clarification if what you were curious about is not addressed. Also, please share your thoughts, if you like, after reading this. The lines all get blurred with these “private-public partnerships” — the BIDS and Conservancies — which are given a lot of leeway over many of our parks in NYC. Yes, a concert does close off the space to only those who can afford to attend and purchase a ticket, but that’s also for a limited amount of time. The Bloomberg L.P. party is closing off a large amount of space for a large amount of time to a private corporation for a private event and shutting out the surrounding community. Part of the reason NYC parks are being increasingly handed over to outside entities is that the NYC Parks Dept has been woefully underfunded for over a decade. However, that doesn’t mean the answer is to privatize everything. Their budget should be increased, yes, but also they could scale back some of these grand plans (like WSP) and focus on maintenance, repair, sprucing up and then pull back on the privatizing of our public spaces. Public spaces, like Randalls Island, Washington Square, Union Square, etc., are important to their communities and people who visit them and they are well utilized. They should remain open to the public for free use and the surrounding communities should have input into what goes on there. Re: places for large outdoor gatherings, I’m not sure if original poster meant for private use or public use but there are places like that for both – maybe not enough of them. But… ? The Union Sq BID was kicking artists out of the park for awhile there (that seems to have stopped) and is working towards putting a private restaurant in the Pavilion in Union Square, a space that has a rich history as a political and community space. The main issue with Bloomberg L.P. usage of Randalls Island is the large amount of time and the large amount of space that is being closed off to the community for a private event by a private corporation. Have a great day and thanks for checking out the WSP Blog. wishing to be there…how much deos this events cost and where deos the money go to ? While ours suffer the ression money is being spent else where….. The above posters speak volumes. This is clearly a not well-researched article. Many events are closed off to the ‘public’ who do not pay or get set up. Also, bear in mind that Bloomberg LP is also a corporate sponsor of nearly EVERY museum in the city (many of which allow you to go in for free and forego the “suggested fee”). Is there any complaint on your end for that? I don’t see you writing articles about how the company is paying for your leisure too…Think for a second, do you think Randall’s Island Maintenance account isn’t benefiting from the massive MONEY they are getting for a couple of weeks of closure. I mean, the benefits from those 2 weeks go to all the public users for the rest of the year. You don’t think park staff and improvements are free…do you? Please read an economics textbook. It is just a coincidence that he USED to run the company and is now the mayor. (He no longer runs the company by the way and the parties still occur) The company still pays for the park. If they got it for FREE, however, that would be something to write about. But they don’t. Hence your article is just a bunch of whine. Would you like some cheese to go with it? PS: Central park sells “field permits” to people every year and has done so for over a decade. These permits allow people to claim fields such as the “dust bowl” on 96th and 5th avenue and kick people who did not pay off the field (since they have a permit). If I decided to walk onto a baseball field where West Side Little League is playing and claimed that they have no right to hold this field from the public, that would make me a moron to you and the rest of the city. Living in a city that takes so much money to run, you should try to wrap your head around economics in general. Everything you seem to take for granted costs money and runs like any other sustainable operation. Revenues must be > or = to expenses.